Nathaniel Wolfe is a boy with a special talent. He can see ghosts. 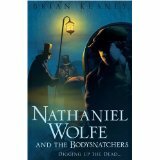 Nathaniel Wolfe and the Bodysnatchers plunges the reader into Victorian London, capturing the true atmosphere of the era including the violent body snatchers who are robbing peoples graves in order to make money. When Nathaniels grandfather steps in to try and stop the robbers, he is shot and Nathaniel feels obliged to stay with him until he recovers. However, somebody else wants Nathaniels assistance. A solicitors clerk has had an encounter with a ghost and, having heard of Nathaniels abilities, would like his help in getting rid of the unwanted visitor. At first, Nathaniel is reluctant to leave, but with his grandfathers encouragement, he agrees to help and we are suddenly part of a detective story, stumbling upon clues as we go. This is the second book featuring Nathaniel Wolfe that Brian Keaney has written. It was a little slow to get started, with the characters awkwardly trying to sum up the books predecessor: "But its true that you foiled the plans of that dreadful man, Mr Chesterfield, who had killed his wife and wanted to kill his stepdaughter? And that you did so after seeing as apparition of some kind?". Once the fairly unnecessary task of reciting the events of the last book was out the way, however, the story picked up pace and turned into a supernatural detective story that I became eager to follow. Each of the characters is unique and has their own personal history and quest in addition to the main adventure of the story. Nathaniel is the reluctant hero who shies away from the unwanted attention his paranormal abilities have earned him. Lily is his enthusiastic, determined friend who has recently changed ranks from a parlour maid to a young lady due to events in the previous book. On the verge of adulthood, Lily is eager to show the world how mature she can be. Sophie is a young lady who has led a sheltered life, but is eager to prove that she can be of assistance in solving the mystery. Although things do not go to plan, Sophie is forced to overcome some of her fears and her character grows as a result. All of the characters are well developed and there are even the beginnings of romantic tension between Nathaniel and Lily, giving us a glimpse into the psyche of the teenage boy. The story is also successful at depicting Victorian London, with information on the transportation, the advances in medicine and vivid descriptions of the sordid characters who lurked around the seedy East End. I think Nathaniel Wolfe and the Bodysnatchers is an exciting read with a cliff-hanger at the end of each chapter to keep you hooked. I hope that Brian Keaney decides to write a third Nathaniel Wolfe book and thankfully, he seems to have left the story open to this possibility. Nathaniel Wolfe and the Bodysnatchers seems like a good introduction to the detective genre as a whole for children and I would highly recommend it to its 9+ age target.